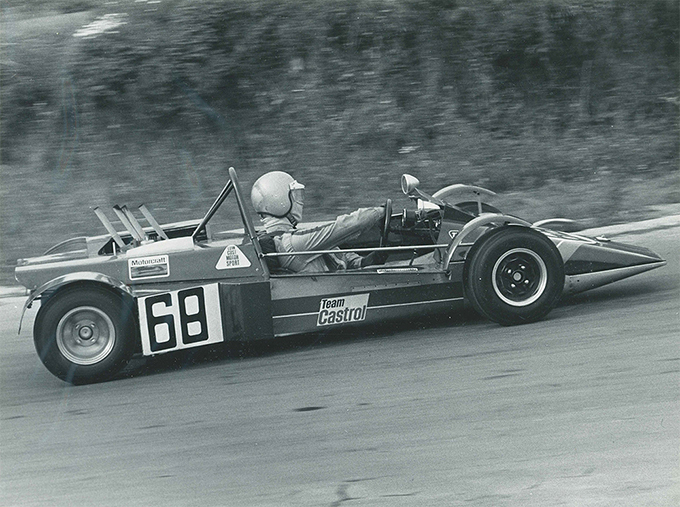 Visitors to Race Retro next weekend will not only have a chance to see a variety of older exotic machinery on display, but also a live build by the 750 Motor Club of a significant car from the history of 750 Formula. ‘The Warren’ was designed by Jerry Evershed, and had instant championship success in the hands of Robin Smyth. Initially distinguished by extra-long front radius rods and a stack of four vertically-protruding exhaust pipes, it was The Warren’s supercharged engine - mounted at the rear of the car - that made the biggest impact. That engine was a Reliant side-valve four-cylinder; recently introduced by the 750 Motor Club to replace the older Austin unit in the Formula. Smyth and Evershed decided not only to supercharge the new 747cc Reliant but also produce their own cylinder head to suit. Their powerplant was canted over at 25 degrees and offset to the left to balance the driver, as well as being reversed front to back, utilising a chain drive from the engine to a propshaft running alongside. Since a live axle was a requirement of the regulations, this rear-engined design was something of a revelation. The Warren’s name however was derived with a much more simplistic approach - it was the name of the road where Evershed lived at the time. With Smyth’s skills behind the wheel and the car packing so many ingenious technological developments, The Warren went on to win the 1973 Championship, taking five lap records along the way. After the tragic deaths of both Smyth and Evershed from cancer before their 40th birthdays, the original Warren made few reappearances before a long lay-up period. 2017 sees the re-launch of 750 Trophy as ‘Historic 750 Formula’; celebrating its ties with one of the world’s oldest formulae yet also highlighting the series itself as the most cost-effective route into historic circuit racing. With such a significant history and fascinating engineering to showcase, the Warren will be rebuilt live by current owner Ron Welsh and the 750 Motor Club at Race Retro before competing once again this season. The car is spearheading a drive to bring all the missing 750 Formula cars out of retirement and back to the track and the build will take place across all three days of Race Retro, from Friday 24th – Sunday 26th February on the 750 Motor Club stand: 1-526, Hall 2. Keep an eye on the Historic 750 Formula Facebook page and the 750 Motor Club’s Twitter feed for updates across the weekend, and the Club will also be capturing the recreation of this iconic car in a time-lapse video. The Club’s stand will also include a current 750 Formula car, a Classic Stock Hatch and a Kaimann Formula Vee; celebrating 50 years of Vee racing in the UK.